We received a copy for review. All opinions are my own. We have always loved The Lion King movies, and since my kids have fallen in love with The Lion Guard. This cute show about Kion. Kion is the son of King Simba and Queen Nala, the younger brother of Kiara and the prince of the Pride Lands. The Rise of Scar is about how Kion Unwittingly Summons the Pride Lands’ Greatest Villain and Threatens the Circle of Life. All of my kids loved the episodes on this DVD. It is a great one to add to your collection! 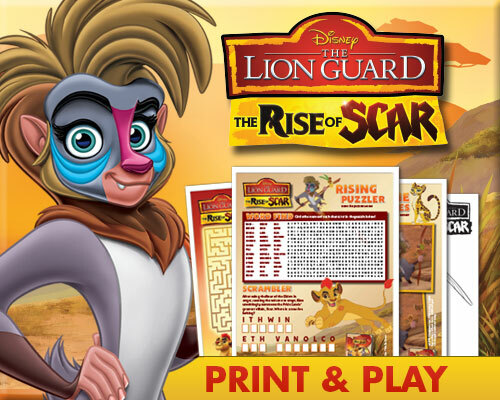 Synopsis: Be prepared for the Rise of Scar! With the arrival of the Dry Season, tensions run high, patience wears thin and thirsty tempers flare. To make matters worse, Janja’s hyenas, aided by Ushari the snake, discover a secret that could bring back the vengeful spirit of the legendary villain, Scar! Voice Cast: David Oyelowo (“Queen of Katwe”) as Scar; Rob Lowe (“St. Elmo’s Fire”) as Simba; Gabrielle Union (“Being Mary Jane”) as Nala; Max Charles (“The Amazing Spider-Man 2”) as Kion; Joshua Rush (“Andi Mack”) as Bunga; Atticus Shaffer (“The Middle”) as Ono; Diamond White (“Sofia the First”) as Fuli; Dusan Brown (“Blaze and the Monster Machines”) as Beshte; Landry Bender (“Fuller House”) as Makini; and Christian Slater (“Mr. Robot”) as Ushari.